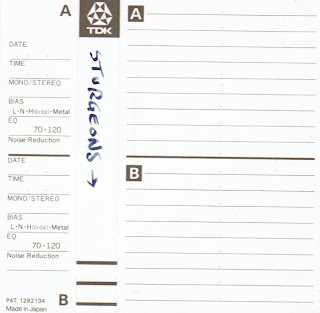 Well, since we posted a more complete Suburban Slag recoding yesterday, it seems only right (again, we have very poor judgement, so this is up for debate) that we post a more complete Sturgeons recording. We found this tape in Mark Igglesden's basement, tucked neatly in behind a massive pile of boxes of model Panzerkampfwagens. Based on the j-card that we rounded up for our original Sturgeons post, we're thinking this is more original as it includes the two covers that were omitted from the original (are you confused yet? we are), the non-originals Nancy Sinatra's"These Boots are Made for Walking" and Petula Clark's "Downtown" (and before you write in, we know those songs weren't written by Sinatra and/or Clark - we're being lazy and not hitting wikipedia, except that we did, because we had one of those moments of panic where we suddenly weren't sure if the Petula Clark version was the canonical version, we began to worry that we had slipped into some bizzaro world where everything was topsy turvy, like for example, maybe Lou Reed was a woman, which actually would make more sense, wouldn't it? maybe we're in the bizzaro world, and... oh, we need to go lie down for a bit). As with yesterday's post, we're going to leave our original Sturgeons demo posting up for posterity, and add this to the mix, since we're pretty shameless about posting the same thing twice (or more). Not really fair. I got it to work fine on the first try. Yellow seal is incomplete for the individuals and humans because the colorful ambit are renowned for the future requirements of the humans through superior papers discount. Subsequent utilization of the blog has been ensured for the respectable individuals for the accomplishment in future. cheap dissertation writing services may contains biblographic informations for facilitate readers. If you want the best essay writing service then visit https://www.apexessays.com/essay-writing-service/ which will provide you excellent quality written paper. Order us now!